2012 Doosan LYNX220 LMA CNC Live Turret Turning Center s/n LM0027-001462 w/ Doosan-Fanuc i-Series Controls, Tool Presetter, 12-Station Live Turret, 6000 Max Spindle RPM, 6000 Live Turret RPM, Full “C” Axis, Hydraulic Tailstock, 2” Thru Spindle Bore, Rigid Tapping, 7” 3-Jaw Power Chuck, 3J Collet Spindle Nose, Coolant, 4,885 “ON” Hours, 1,950 Cut Hours. 2008 Doosan LYNX220 LMA CNC Live Turret Turning Center s/n L220LM0568 w/ Doosan-Fanuc i-Series Controls, Tool Presetter, 12-Station Live Turret, 6000 Max Spindle RPM, 6000 Live Turret RPM, Full “C” Axis, Hydraulic Tailstock, 2” Thru Spindle Bore, Rigid Tapping, 7” 3-Jaw Power Chuck, 3J Collet Spindle Nose, Coolant, 18,055 “ON” Hours, 8,527 Cut Hours. 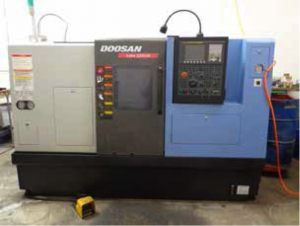 2011 Doosan LYNX220A CNC Turning Center s/n ML0013-0005275 w/ Doosan-Fanuc i-Series Controls, Tool Presetter, 12-Station Turret, 6000 Max Spindle RPM, Hydraulic Tailstock, Rigid Tapping, 7” 3-Jaw Power Chuck, 3J Collet Spindle Nose, Coolant. 2010 Doosan LYNX220A CNC Turning Center s/n L22044458 w/ Doosan-Fanuc i-Series Controls, 12-Station Turret, 6000 Max Spindle RPM, Hydraulic Tailstock, Rigid Tapping, 7” 3-Jaw Power Chuck, 3J Collet Spindle Nose, Coolant, 11,689 “ON” Hours, 5,566 Cut Hours. 2003 Daewoo LYNX210A CNC Turning Center s/n L2103310 w/Daewoo-Fanuc i-Series Controls, 12-Station Turret, 6000 Max Spindle RPM, 1 ¾” Thru Spindle Bore, 6” 3-Jaw Power Chuck, 3J Collet Spindle Nose, Coolant, 29,601 “ON” Hours, 13,290 Cut Hours. 2001 Daewoo LYNX200 CNC Turning Center s/n L2002217 w/ Fanuc Series 21i-T Controls, Tool Presetter, 12-Station Turret, 6000 Max Spindle RPM, Rigid Tapping, 6” 6-Jaw Power Chuck, 3J Collet Spindle Nose, Coolant. 1998 Daewoo LYNX200 CNC Turning Center s/n L2000513 w/ Fanuc Series 21-T Controls, 12-Station Turret, 6000 Max Spindle RPM, Hydraulic Tailstock, 6” 3-Jaw Power Chuck, 3J Collet Spindle Nose, Coolant. 2009 Sharp SV-2412S 4-Axis CNC Vertical Machining Center s/n 80701132 w/ Fanuc Series 0i-MC Controls, 16-Station ATC, CAT-40 Taper Spindle 10,000 Max RPM, Rigid Tapping, Chip Conveyor, ATS/Rockwell mdl. 165 4th Axis Rotary Head with 3J Spindle Nose, Coolant, 8039 “ON” Hours, 2,420 Cut Hours. 2012 Atlas Copco mdl. GX5 FF EP CSA/UL 7.5Hp Rotary Air Compressor s/n CAI 599724 w/ 310 Metered Hours. 2011 Atlas Copco GX5 FF CSA/UL 7.5Hp Rotary Air Compressor s/n CAI 473726 w/ 1,089 Metered Hours. Raileigh mdl. ES-260SA 9” Horizontal Miter Band Saw s/n 061222261 w/ Power Clamping and Feeds, Coolant. Baldor Carbide Tool Grinder w/ Diamond Wheels. Glendo Corp Accu-Finish Series I Carbide Tool Lapping Machine w/ Diamond Wheels. (2) Jet 6” Pedestal Grinders. (3) Jet 6” Bench Grinders. Jet 12” Bench Model Drill Press. Milwaukee 2” Belt Sander / 6” Grinder. Collet Chucks w/ ER20 Flex Collets. Insert Drills, Turning and Grooving Tooling, Boring Bars, Carbide Inserts. Carbide Coolant Thru Drills, Drills, Taps, Reamers. Craftsman 8-Drawer Roll-A-Way Tool Box. MicroVu mdl. 6X6 Video Measuring System w/ Upgraded Quadra-Chek 200 Programmable DRO, 6” x 6” Table Cap, MicroVu mdl. 9050-A Video Reticle 100X Control Unit. IR Industries Stereo Microscope w/ Light Source. 6” x 6” Granite Indicator Base w/Fowler Digital Drop Indicator.